My wife tells me there are too many fish dishes on Ravenous Fox and not enough meat. So here is something beefy to get your teeth in to. It’s a little more technical than most dishes I do but it’s absolutely doable with a little time and effort! 100ml Stock taken from draining the Porcini. 1. You need to make your pasta first. Combine your ingredients in a bowl and gently incorporate the eggs with your fingertips. It will slowly come together looking a little like crumbs. 2. Transfer the mixture to a flat service and begin to kneed pushing the dough away from you then turning and repeating until you have a smooth dough. Wrap in some cling film then pop in the fridge. 3. Pour your stock in to a pan and the water from soaking the Porcini, add 1/2 a finely chopped shallots then gently heat and reduce by about 3/4 until the sauce begins to coat the back of the spoon. 4. To make the ravioli filling gently sweat off the shallots and garlic in a pan until soft but not coloured. Drain on kitchen towel then add to a deep bowl with the ricotta, Parmesan, Porcini, egg and parsley. Stir with a wooden spoon then season well with salt and black pepper. Cover then pop in the fridge for 20 minutes to firm up. 5. Take the pasta dough out of the fridge and divide in two to make rolling easier. Flour your surface and begin to roll. Take your time as you want to get the pasta super thin so if you blow under it it will ruffle. Cut 2 oblongs out of the pasta then dot your filling on even spaces. Use about 1 heaped teaspoon. With a pastry brush then coat the bottom sheet of pasta with a little beaten egg. Gently lay on the top pasta sheet and gently push down around the filling making sure you don’t get any air bubbles. Finally use a scone cutter to make the ravioli nice and even. 6. Season your steaks with salt and pepper and cook in a pan with a little olive oil and a knob of butter to your own preference. 7. In a pan of gently boiling salted water pop in your ravioli and cook for about 2 minutes. Meanwhile take your steak out to rest. Add a knob of butter to your sauce and a pinch of white pepper to finish it. Gently whisk as it melts. 8. Time to assemble. 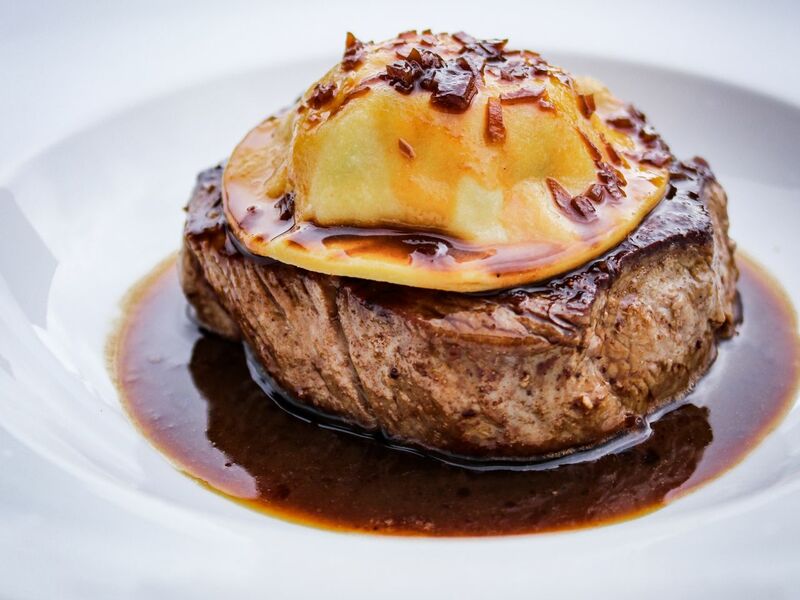 Place your steak in the middle of the plate then top with the ravioli. Gently pour over your sauce then serve.